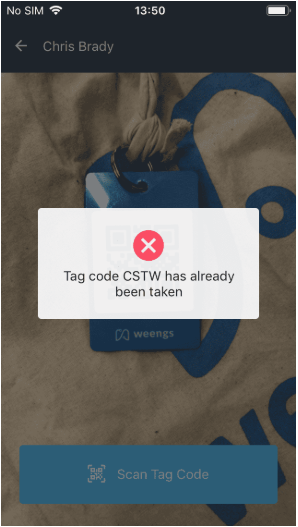 The Weengs App is an easy-to-use tool that scans bag codes for your pending shipments. You can download it from iStore or the Google Play store. ✅ Add bag codes to your dashboard. ✅ Remove bag codes from your dashboard. ❌ Request a pickup. Even if auto request pickup is ON in your dashboard. Please trigger a pickup manually from the dashboard when you scan tag codes with the app, even if your dashboard auto request pickup is on. To do this, click the ‘Request a pickup’ button at the top of your dashboard. You can download the app from Google Play or App Storeby following the links for each or by searching for ‘Weengs’. When you open the app you’ll see a blue Weengs sign-in screen. Please sign in with the same Weengs user details that you use for your Weengs dashboard. 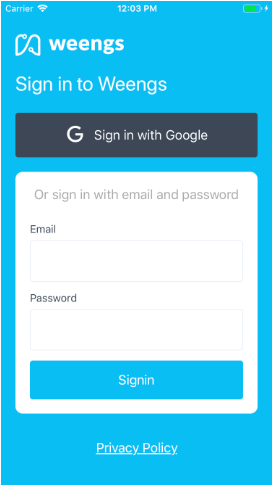 You can sign in via Google (only your Weengs details will work) or by simply entering your email and password associated to the Weengs dashboard. This will be the first screen you’ll see once you have successfully signed in. You’ll be able to see the list from your dashboard. This is where you’ll see any new shipments you’ve imported or added manually via the dashboard. Tapping on a shipment will pop up information about the items related to the shipment. See below, highlighted in green. 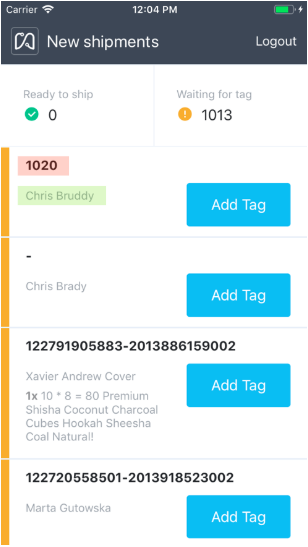 For each shipment, you have the option to ‘Add Tag’. Tapping on ‘Add Tag’ will take you to the next screen. 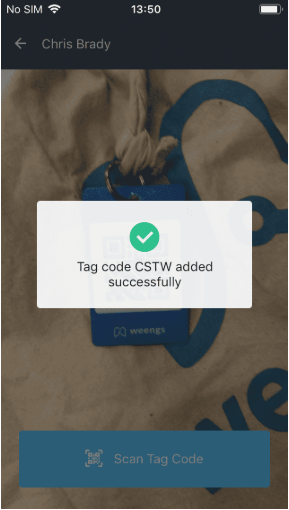 The first time you use the app for adding a tag, you’ll be asked to allow Weengs to use your phone’s camera. The request will show up differently from iOS to Android but in either of the cases, you’ll have to allow this action in order to be able to use the app for scanning tag codes. Once the Weengs app is allowed to use the camera, you will see the view from your back camera. You’ll also see a blue ‘Scan Tag Code’ button. Find the bag code you want to scan and tap the button. You will receive a notification once the camera picks up the code, and you will receive one of the messages shown below. You will need to click the ‘Scan Tag Code’ button each time you want to scan a new tag code. 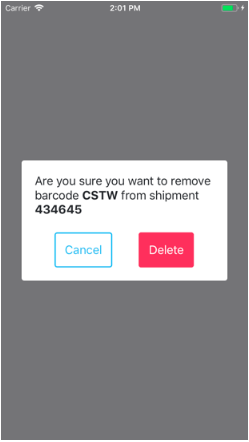 This allows you to scan multiple tag codes for each shipment. Once you have finished, return to the list of shipments by pressing the back button. When you already have bag code(s) added to a shipment, or you have added one through the app, you will see this shipment listed as ‘ready to ship’. For shipments that are ‘ready to ship’ you will see a new button, under the ‘Add Tag’ button, called ‘Manage Tag(s)’. 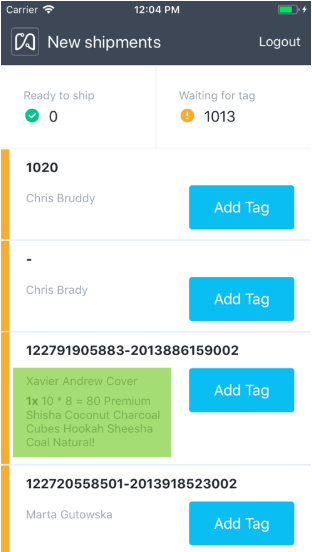 Clicking on ‘Manage Tag(s)’ will take you to a new screen that shows a list of the barcodes associated with that shipment. To remove a code, simply tap on it. This is pop up a message asking you to confirm. Confirm that you would like to delete the tag code, and the tag code will be deleted. You will be taken back to the shipments list page.